Amcor Limited, Bemis Company, Inc., BillerudKorsnas AB, and E.I. DuPont De Nemours and Company have been the key players in the global sterile medical packaging market so far. Three of these players holds a highly prominent dominion in North America while one of them is a leading manufacturer in Europe. According to a research report released by Transparency Market Research, the key companies have focused on a diverse range of actions including mergers and acquisitions, including mergers and acquisitions, expansion of capacities, and the launching of new products. 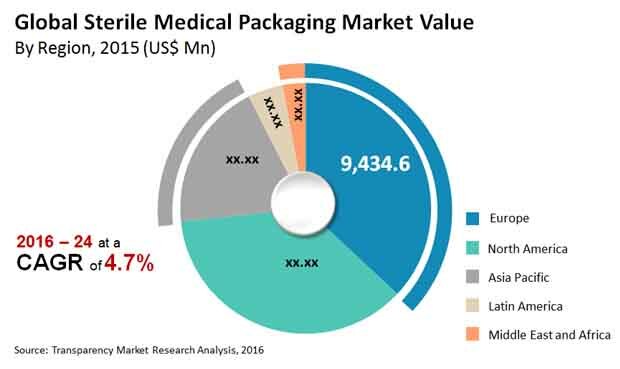 The global sterile medical packaging market is expected to reach US$38.2 bn by the end of 2024, after expanding at a CAGR of 4.7% within a forecast period from 2016 to 2024. The market revenue is likely to reach US$26.5 bn by the end of 2016. A key revenue generator for the global sterile medical packaging market is the cumulative segment of pharmaceuticals and biologics. This segment is expected to produce nearly 64.3% of the total revenue of the market in 2016. The past few years have been very important for pharmaceutical packaging, in terms of materials used. Manufacturers of vials and ampoules especially have shown a greater preference for plastics over glass, the conventional material. This is a key change in raw materials as well as a drastic improvement in manufacturing rates. In terms of utility, plastic has proven to be a far superior sterile medical packaging in comparison to other materials, therefore creating not only a greater demand for it from conventional end users, but also increase the scope of use for these products in a more diversified environment. “Players in the global sterile medical packaging market are discovering the advancements in materials and technologies that have not only allowed a far greater scope of manufacturing process automation, but also a faster rate of manufacturing. A lot of conventional materials such as glass were difficult to undertake complete automation with. The advent of advanced polymers has successfully mitigated that in order to open new horizons of utility for sterile medical packaging. Plastic raw materials are much easier to obtain, allowing manufacturers to pump up their production rates,” states a TMR analyst. Additionally, the global sterile medical packaging market is also being bolstered by other technological advancements, such as the use of nitrogen dioxide as a very effective surface sterilizer. One of the key problems that sterile medical packaging manufacturers need to address currently is the complexities of handling certain drug packets or pouches during transportation and delivery. Quite a few types of sterile medical packaging are susceptible to tearing during handling and the distribution chain handlers need to be extremely careful to avoid that. Manufacturers are looking to modern materials for better strength and durability, and plastics seem to be the way to go for now. “Players in the global sterile medical packaging market are beginning to focus greatly on Asia Pacific which holds a highly promising healthcare and pharmaceuticals sector. A lot of the leading players in this market are already generating high ROI from their expansion projects in Asia Pacific using the widely popular outsourcing models,” adds the analyst.